Nic loves his freaky clown shoes. This post explains why. My happy FiveFinger family. From front left: Sprint, Trek LS, KomodoSport, KSO Trek. I’m about as far from a tree-hugging hippie as you can get, but am nevertheless growing concerned with how divorced from physical reality we are as a culture. We are physical beings and what we do with our bodies affects everything about us: how we feel, how we act, how happy we are. The Judeo-Christian tradition of a gulf of separation between body and mind may be one of the most toxic things we have to deal with. We are physical. When we eat, we consume chemicals our bodies convert to other chemicals which we then use for fuel. When we exercise, we excrete hormones which are used by our brains to affect our moods. Every thought we have is caused by chemicals. We, as living creatures, are the result of chemical reactions. Every thought and idea we have are the result of a soup of chemicals. But we exist in a society where there’s much money to be made from denying that fact. There are pills that will fix you, pills you can buy which will stop the heartburn you get from eating the wrong foods and pills you can buy which will let you sleep even after you crash your body chemistry from staying up watching TV eating chips. All you have to do is pay and you can not suffer the effects of bad decisions. Isn’t that great? Do what you know is wrong, pay some money and you don’t have to deal with the consequences! So I’m trying to change things about the way I live my life. I don’t want to be a part of the hands-over-ears movement any more. Habits, nutrition, exercise, everything I can, I’m changing it, in order to become less of a brain attached to a meat sack with Cheeto-stained fingers and more of a functioning human being. I’m learning (and especially re-learning) a lot doing this. This post is about the physiology of feet, excitingly enough. Feet? Indeed, feet. See, your feet are miracles of engineering. Twenty-six bones, assorted tendons and muscles to keep you upright and moving. Your feet are the foundation of you as a phycial being. So after a lot of thinking and reading, I have become one of those annoying guys with clown shoes. That’s right: FiveFingers. Instead of soothing my midlife crisis with a sports car I’m self-medicating with shoes. I’m not sure if that means I win or lose, but it is what it is and I feel good about it. There are sound physiological reason for wearing FiveFingers (or any kind of thin-soled shoe that lets your toes move): Encasing the marvelous structures that are your feet in shoes is like putting your arm in a cast: the muscles atrophy and problems develop. If you have one handy whose parents won’t call the cops on you, take a look at the feet of a small child. Look at how their toes splay. They can wiggle their toes like you wiggle your fingers. Now take off your own shoes and socks and wiggle your own toes. Not such a pretty picture, is it? Why does it matter? Because you evolved over the millennia to walk barefoot. Your back, your legs, even your neck depend on your feet being able to work as intended. Once the foundation of your entire bipedal existence goes out of whack, your whole body goes out of whack. Back pain, neck pain, knee problems. Not good times. If there’s one thing my FiveFingers do for me, it’s that they make me want to move. In touch with the ground. The feeling is hard to communicate and yes, does feel like hippie crap even to me as I write this, but it’s there and it’s real. If you lift weights, the Sprint model is a delight: Being in direct contact with the ground improves your balance substantially. I can’t recommend them enough for strength training. 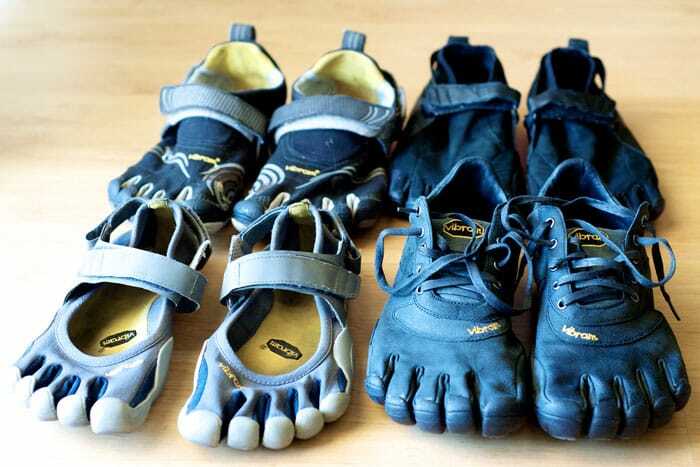 But there’s one problem: The FiveFingers have a thin sole. That’s their whole purpose, to let the toes do their thing. So if you take long walks or runs in the thinnest FiveFingers, your feet get torn up pretty badly until the point in time when you develop serious calluses. Enough blisters so you can’t walk. Or stand. Which is obviously low on the fun scale. To alleviate this, Vibram also makes FiveFingers with thicker soles, like the KomodoSport. The company is walking a fine line between making the soles thick enough you don’t get all blistered up and enable you to walk on surfaces like gravel without pain, but still thin enough you can feel the ground and move your toes. In some cases I think they’ve crossed that line, creating a “normal” shoe with freaky toe pockets that serve little function. Caveat emptor. But of course, it’s personal preference. There’s no denying that walking in FiveFingers is really weird at first. Not to mention putting them on. At first, your toes are not used to fitting into pockets and you probably have poor toe control as well. It’ll take some effort in the beginning. This is also one of the reasons most people recommend your first pair be one of the open ones like the Classics or Sprints. They’re way easier than the covered pairs to get into in the beginning. They’re also good starter shoes since they’re the thinnest and will give you the most bio-feedback on your gait. See, if you’re like me with a history of long-distance running in padded shoes, you heel strike (land on the heel). As you will discover during your first walk in the FiveFingers, this is a really, really bad way to walk barefoot. You have to change your gait to land evenly on the feet, or even on the pads of the feet. This takes a long time—your entire body has to change a life-long habit. Which brings up the other rule of switching to FiveFingers: Take it easy. Only wear them for a short walk or run the first time. Like, really short. Ten minutes. Then to the grocery store or whatnot. If it hurts, stop. If you force it you will probably injure yourself. You’re changing the fundamentals of how you move and going back to how your body is supposed to do it, undoing a life time of bad habits. As long as it feels OK, increase the time and length. After a while you’ll be able to wear them full-time. Note that FiveFinger sizing is a bit odd (like everything else about them, amirite?) so you definitely want them fitted. Find a local store. To make it worse, different models are sized slightly differently, so unless you’re buying another pair of the same model, you’re going to need to check the size. And yes, this is very annoying. So you’re wearing your FiveFingers and feeling good about life in general. One issue you’ll have to deal with is that you get questions about them. This is great if you happen to be a people person, not so great if you’re not. So there’s that to factor in. And of course there’s the question of wearing them to work. I work at a university, so the dress code isn’t what you’d call uptight, but if you’re working some place where you might get pushback for your choice of footwear, it might make sense to wear FiveFingers on your own time and then get the thinnest possible loafers you can get away with for office wear. Still, more and more people are wearing them around and some models like the KSO Trek and Trek LS aren’t too outré. Might be worth chancing it. After all, It takes a big man to yell at another man in a tie wearing black hobbit feet.